The midnight runs to complete nightjar survey routes will be arriving soon and the 2015 survey dates have recently been chosen. These dates are specifically chosen to coincide with the nights of brightest moonlight and greatest nightjar calling frequency. 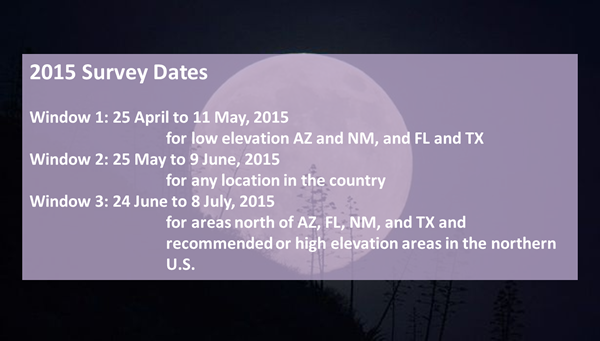 These are important dates to use so survey conditions are standardized across all regions of the Nightjar Survey Network. If you ever have a question regarding the best date for your route always feel welcome to contact nightars@nightjars.org with your inquiry. Window 3: 24 June to 8 July, 2015 for areas north of AZ, FL, NM, and TX and recommended for high elevation areas in the Northern U.S.
Special thanks to all returning participants for your years of support and I welcome the new nightjar survey gang members for the 2015 season.